"Leave the past to the mercy of God..."
"Leave the past to the mercy of God, the present to His love, and the future to His Providence." 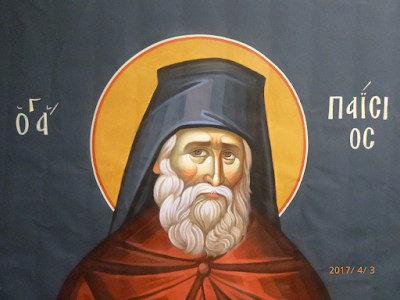 Note: This is a wonderful talk by a great spiritual guide of our days, and spiritual son of Elder Joseph of Vatopedi, Metropolitan Athanasios of Lemesos (Cyprus). In this talk in Greek (with English subtitles provided by the wonderful Pemptousia website), the Metropolitan discusses the end times and the Last Judgment of Christ, but does it in such a loving and gentle and moving way, to convince us to prepare ourselves to face Christ, and not have unnecessary anxieties and agitations about the evils that are to come. May we continue to turn to our Merciful Lord in repentance and day by day purify our hearts so that we might behold our Beloved when our day comes! 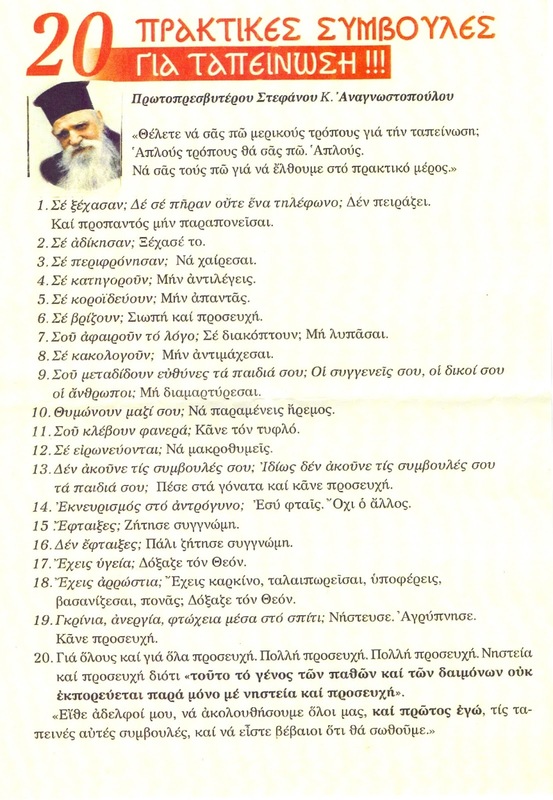 Note: Truly beautiful and astonishing are these "Beatitudes" of St. Paisios the Athonite, modeled after the Beatitudes of Christ and the lives and writings of the Saints. May we be humbled by his love, sacrifice and self-denial, on behalf of God and his fellow man. 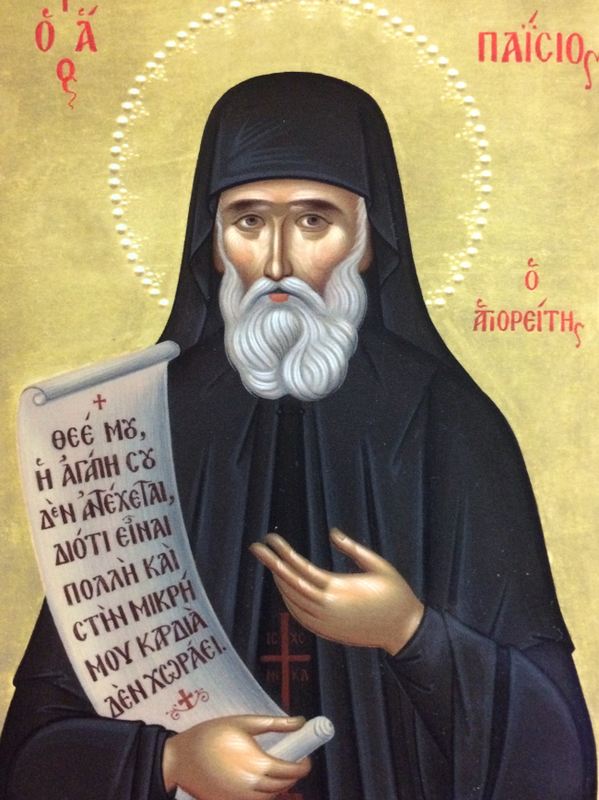 May we not despair of our weakness and sinfulness, but make a small effort, through the discretion and guidance of our spiritual fathers to make a change for the better, through the intercessions of such a great saint of our century! 1. 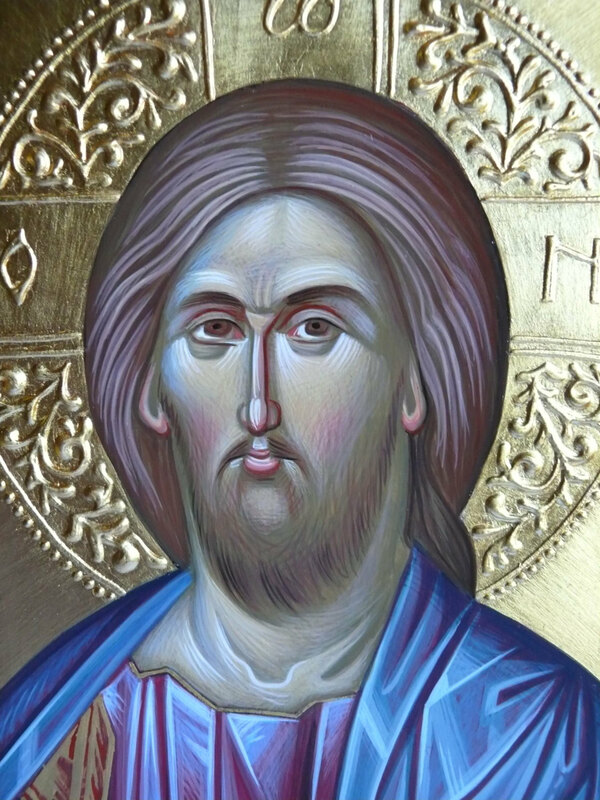 Blessed are those who love Christ more than all the worldly things and live far from the world and near God, with heavenly joys upon the earth. 2. Blessed are those who manage to live in obscu­rity and acquired great virtues but did not acquire even a small name for themselves. 4. Blessed are those who do not preach the Gospel with words, but live it and preach it with their silence, with the Grace of God, which betrays them. 5. Blessed are those who rejoice when unjustly ac­cused, rather than when they are justly praised for their virtuous life. 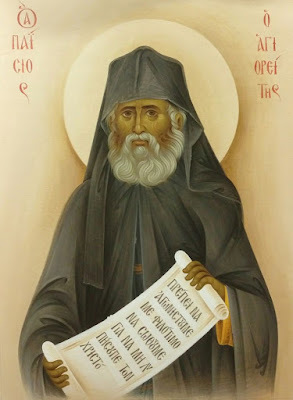 Here are the signs of holiness, not in the dry exertion of bodily asceticism and the great number of struggles, which, when not carried out with humility and the aim to take off the old man, create only illusions. 6. Blessed are those who prefer to be wronged rather than to wrong others and accept serenely and silently injustices. In this way, they reveal in practice that they believe in “one God, the Father Almighty” and expect to be vindicated by Him and not by human beings who repay in this life with vanity. 7. Blessed are those who have been born crippled or became so due to their own carelessness, yet do not grumble but glorify God. They will hold the best place in Paradise along with the Confessors and Martyrs, who gave their hands and feet for the love of Christ and now constantly kiss with devoutness the hands and feet of Christ in Paradise. 8. Blessed are those who were born ugly and are de­spised here on earth, because they are entitled to the most beautiful place in Paradise, provided they glorify God and do not grumble. 9. Blessed are those widows who wear black in this life, even unwillingly, but live a white spiritual life and glorify God without complaining, rather than the mis­erable ones who wear assorted clothes and live a spot­ted life. 10. Blessed and thrice blessed are the orphans who have been deprived of their parents’ great affection, for they managed to have God as their Father already from this life. At the same time, they have the affection they were deprived of from their parents in God’s savings bank “with interest”. 11. Blessed are those parents who avoid the use of the word “don’t” with their children, instead restraining them from evil through their holy life – a life which chil­dren imitate, joyfully following Christ with spiritual bravery. 12. Blessed are those children who have been born “from their mother’s womb”(Mt. 19:12) holy, but even more blessed are those who were born with all the inherited passions of the world, struggled with sweat and up­rooted them and inherited the Kingdom of God in the sweat of their face (Cf. Gen. 3:19). 13. Blessed are those children who lived from in­fancy in a spiritual environment and, thus, tirelessly ad­vanced in the spiritual life. 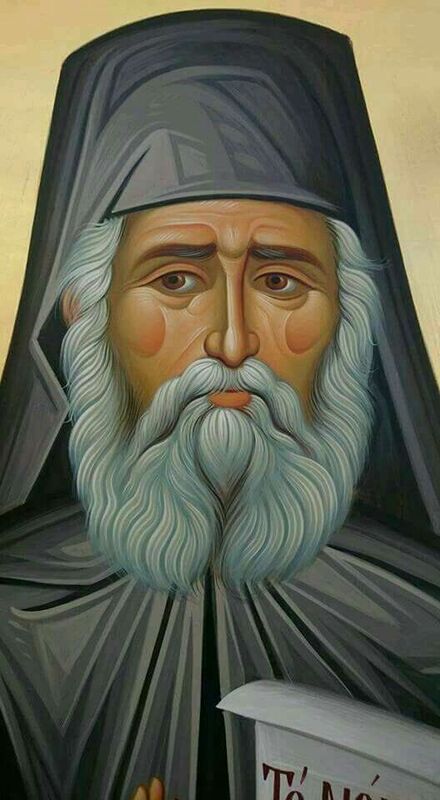 Thrice blessed, however, are the mistreated ones who were not helped at all (on the contrary, they were pushed towards evil), but as soon as they heard of Christ, their eyes glistened, and with a one hundred and eighty degree turn they suddenly made their soul to shine as well. They departed from the attraction of earth and moved into the spiritual sphere. 14. Fortunate, worldly people say, are the astronauts who are able to spin in the air, orbit the moon or even walk on the moon. Blessed, however, are the immaterial “Paradise-nauts”, who ascend often to God and travel about Paradise, their place of permanent abode, with the quickest of means and without much fuel, besides one crust of bread. 15. Blessed are those who glorify God for the moon that glimmers that they might walk at night. More blessed, however, are those who have come to understand that neither the light of the moon is of the moon, nor the spiritual light of their soul of them­selves, but both are of God. Whether they can shine like a mirror, a pane of glass or the lid of a tin can, if the rays of the sun do not fall on them, it is impossible for them to shine. 16. Fortunate, worldly people tell us, are those who live in crystal palaces and have all kinds of conven­iences. Blessed, however, are those who have managed to sim­plify their life and become liberated from the web of this world’s development of numerous conveniences (i.e. many inconveniences), and were released from the frightening stress of our present age. 17. Fortunate, worldly people say, are those who can enjoy the goods of the world. Blessed, however, are those who give away every­thing for Christ and are deprived even of every hu­man consolation for Christ. 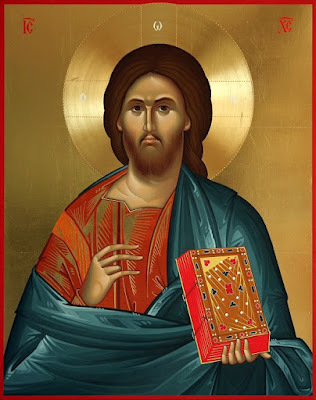 Thus it is that they man­age to be found night and day near Christ and His di­vine consolation, which many times is so much that they say to God: “My God, Thy love cannot be en­dured, for it is great and cannot be fit within my small heart”. 18. Fortunate, worldly people say, are those who have the greatest jobs and the largest mansions, since they possess all means and live comfortably. 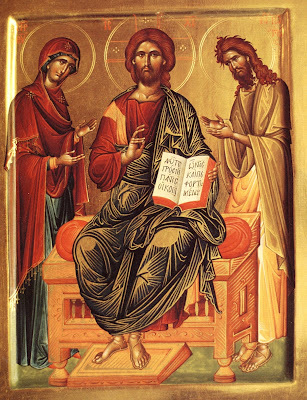 Blessed, however, according to the divine Paul, are those who have but a nest to perch in, a little food and some coverings99• For, in this way, they’ve managed to become estranged from the vain world, using the earth as a footstool, as children of God, and their mind is con­stantly found close to God, their Good Father. 19. Fortunate are those who become generals and government ministers in their head by way of heavy drinking (even if just for a few hours), with the world­ly rejoicing over it. Blessed, however, are those who have put off the old man and have become incorporeal, managing to be earthly angels with the Holy Spirit. They have found Paradise’s divine faucet and drink from it and are con­tinually inebriated from the heavenly wine. 20. Blessed are those who were born crazy and will be judged as crazy, and, in this way, will enter Paradise without a passport. Blessed and thrice blessed, however, are the very wise who feign foolishness for the love of Christ and mock all the vanity of the world. This foolishness for Christ’s sake is worth more than all the knowledge and wisdom of the wise of this world. I beg all the Sisters to pray for God to give me, or rather take from me my little mind, and, in this way, se­cure Paradise for me by considering me a fool. Or, make me crazy with His love so I go out my self, outside of the earth and its pull, for, otherwise my life as a monk has no meaning. I became externally white as a monk. As I go I become internally black by being a negligent monk, but I justify myself as one unhealthy, when I hap­pen to be so; other times, I excuse myself again for be­ing ill, even though I am well, and so I deserve to be thoroughly thrashed. Pray for me. Note: These succinct, practical examples of the Beatitudes or the Lives of the Saints, are wonderful reminders of the love, humility and repentance that Christ calls us to. However, please always make sure that you are under the guidance of your spiritual father to prevent any delusion or damage to yourself or your family. Did they forget you? They don’t even pick up the phone? It doesn’t matter. Were they unjust to you? Forget about it. Do they despise you? Rejoice. Do they condemn you? Don’t fight back. Do they ridicule you? Don’t respond. Do they curse you? Be silent and pray. Do they not let you speak? Do they cut you off? Don’t be sad. Do they speak evil of you? Don’t fight back. Do your children, your relatives and your own people take away your rights? Don’t complain. Do they get angry with you? Remain peaceful. Do they rob you openly? Be blind to it. Do they mock you? Forbear it. Do they not listen to your advice, especially your children? Fall to your knees and pray. Are you upset with your spouse? You are to blame, not the other. Were you to blame? Ask forgiveness. You weren’t to blame? Again ask forgiveness. Do you have health? Glorify God. Do you have sickness? Do you have cancer, depression? Are you suffering, tortured, in pain? Glorify God. Complaining, unemployment, poverty in the house? Fasting. Vigil. Prayer. May we all, my brethren, and first of all myself, follow these humble suggestions, that we may be sure that we will be saved. 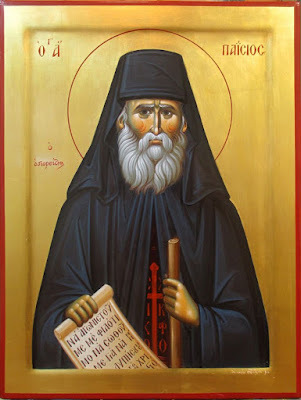 The sinful man, my beloved, (in other words, he who does not sense his sins and does not repent, because we are all sinners), who does not repent according the Holy Scriptures resembles an old an unworked field, which is full of wild weeds, thorns and serpents. He is a land "in danger of being cursed", as the Apostle Paul says (Hebrews 6:8). As opposed to this, the saint is like a worked field, like the "good earth" from the Parable of the Sower, where the Sower reaps a harvest from some 30-fold, some 60-fold, some 100-fold (Matthew 13:8, Mark 4:8). The saint is a chosen garden of God. And just as it is pleasant to walk in a garden, so pleasant it is to read the lives of the saints, they are spiritual gardens. 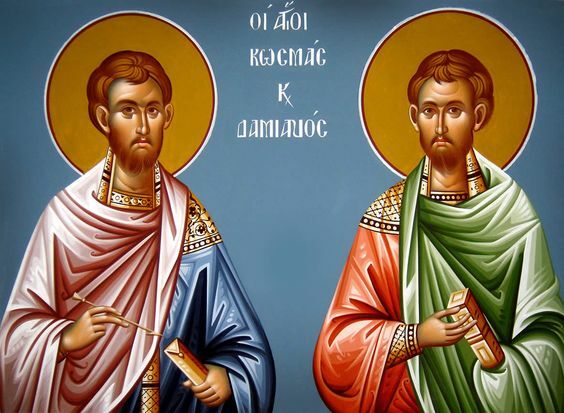 A spiritual garden are the saints which we celebrate today, the Holy Unmercenaries Kosmas and Damian. And just as we gather flowers when we go to a garden in order to make a beautiful bouquet, thus today, reading through the life of these saints, we will cut a few spiritual flowers in order to weave a crown. The first flower--the first lesson which we take from the life of Sts. 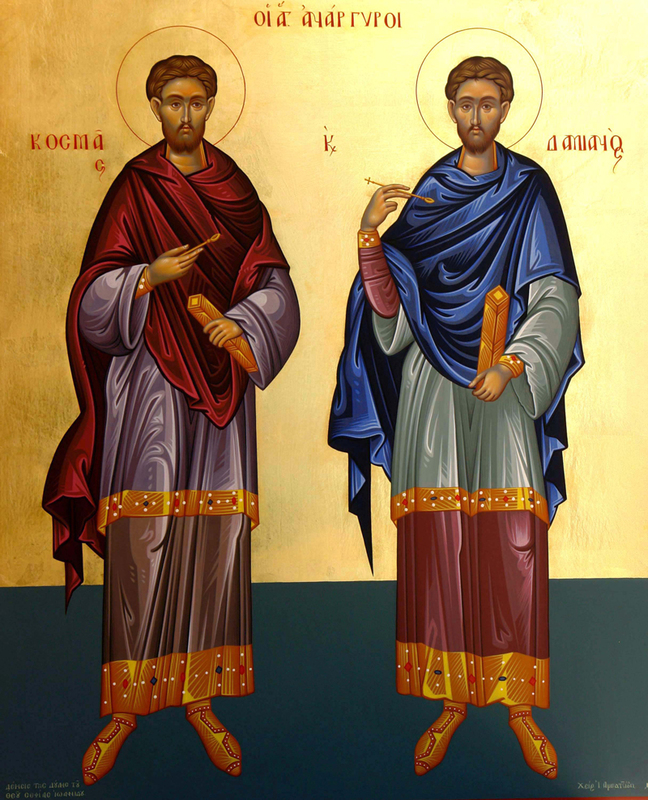 Kosmas and Damian, is love, as the Apostle Paul relates in today's Epistle reading (I Corinthians 12:27-13:8). They had love between them. They were brothers, from one mother and one father. But is this enough? Love of blood relatives is not steadfast. We have many examples: brothers, who were born from the same mother and nursed on the same milk and raised in the same house, who later each go their separate ways. 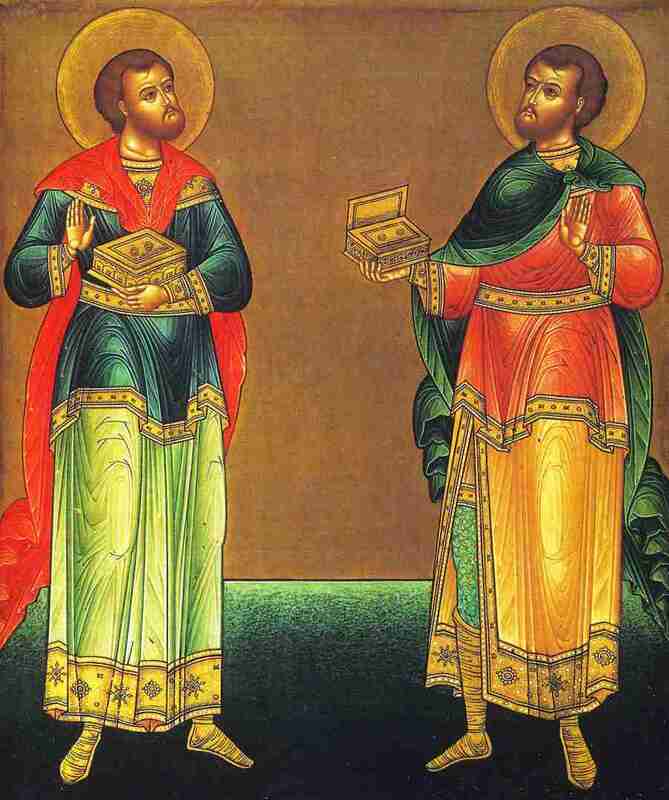 The Holy Scriptures tell us that Cain and Abel were brothers, but Cain murdered Abel and killed him. Since then, there is enmity between brethren. Yesterday in Florina, one brother threw out of their father's house his brother with five children. The day before yesterday, again, there came to the Metropolis someone else who was saying beautiful words, and I started to believe that he was a good man. But later someone else told me: "Didn't you ask him, how long has it been since you spoke to your brother? They lived in the same village, their homes were close by, but Christmas would come, Holy Friday would come, Pascha would come, great days, and he wouldn't even say a 'Good morning' to him." I said, "Is that true? Do you appear to be a Christian but don't speak with your brother?" He replied, "I talk to everyone, but to my brother, no." "But why?" "I won't speak with him, no matter what anyone says." I tried to reconcile them, but it remained impossible. The Holy Unmercenaries were brothers, but that which united them was not blood, nor money, nor anything else physical. It was Christ Who united them. Satan divides, Christ unites. And Christ took these two brothers and made them one soul and one heart. They were beloved in life, and beloved in death, in martyrdom, and beyond the grave into eternity. They had love, not so much love from between family members and blood, but more so love from spiritual family and a common faith. The one flower in this beautiful garden of the saints is love. What is the other? What age were these saints? Where they gray-haired elders 80 or 90 years old? No, they were young, in the flowering of their age. There is the idea that religion is for old men and women and for those who are preparing for death. This is wrong. Religion is for everyone. It is for children, for women, and men, and for elders. But it is first and foremost for the youth. If you excuse the phrase, Christ is useful for everyone. Just like the sun is useful for everyone, both for the little child and the old man, thus it is with Christ. There is no one who can tell the sun that he doesn't need it. The sun is needed by king and poor man, woman and man, black and white, by everyone. Thus it is the with religion, it is useful for everyone, but especially for the youth. The old man resembles a boat which, hour by hour is getting ready to lower its anchor into the harbor, into eternity, while the young man is leaving the harbor and faces great waves, storms and winds, and the boat must be armed with hope, faith and the love of God. The Holy Unmercenaries are an example of this. These two brothers believed in Christ from a young age, and lived in purity. Their example shows us that even young people need faith in Christ. Love and faith, and the third flower from the beautiful garden of the saints? What were the Holy Unmercenaries, learned or unlearned? They were not unlearned, though there are many unlearned saints. But these two were scientists. They were physicians. And they were the best physicians of their era. Sick people, who could not be healed by any other physicians, hastened to Kosmas and Damian and they made them well. How? With medicines? Yes, with medicines that they made from healing herbs that they gathered from the mountains and vales. But above all of the other medicines, however, was their wonderworking prayer. In the name of Jesus Christ the Nazarene, they healed every illness. What does this show? That religion is not just for unlearned people, like many think. This is wrong. They make fun of science and say that scientists don't believe in God. This is a lie. Why? Who are the scientists that they are thinking of? Those who get a diploma and later close their books and go play games and go out and say that there is no God, they are not scientists. They are scientists who sit day and night and read. They are the true scientists, therefore, who believe in God, And we have such scientists, astronomers, physicists, mathematicians and others, who believe in God just like a villager or a shepherd. Do you want an example? In our days there is great achievement that man went to the moon. How did he go? With a rocket that propelled a spaceship. The rocket, who made it? A scientist. 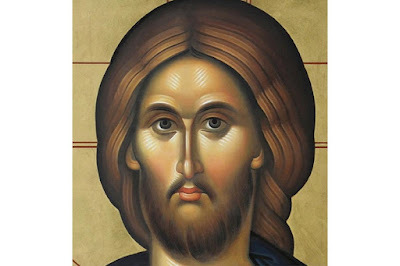 Let's not say his name, let us not say the names of foreign people in church, but those of the apostles and the saints. Let's just say that he is a German man. But he believes! Last year he came to Greece. He went to Mykonos where thousands of tourists were gathered for the summer. On Sunday, when the church bell ran, no one went to church, they went to the beach. He went like a little child and listened to the Divine Liturgy. Later they asked him, "Do you believe?" "Of course, after discoveries like that I believe in God even more..." And it is not just him, but many other scientists believe. And in our homeland there are many scientists and students who believe in Christ (mathematicians, physicians, philologists, etc.). They work and study in great cities, which are a great abyss, Sodom and Gomorrah, but they believe deeply in God. Three things therefore, my beloved, the Holy Unmercenaries teach us today. The first, to have love, because we are all brethren. The second, to have, first and foremost the young people, purity and cleanliness. And the third, that all learning cannot separate man from God, but can bring him closer to Him. Faith and holiness were not only "at that time". And today and tomorrow and until the close of the world they will not abandon us. They stars may fall, and the rivers may dry up, and the mountains melt, and everything may flee away, but there will not come a day that there are no Christians. There will always be men who believe in Christ, and who will be ready to trade their life for a crown, like Sts. Kosmas and Damian, whose intercessions may ever be with you, unto the ages of ages. Amen.